With Valentine’s Day coming up is romance on your mind? It certainly has been on mine! Since I love planning date nights with my boyfriend, I’ve been wanting to share romantic date ideas you could share with your boo, too. When I considered writing a blog post full of date night ideas, the first destination to spring to mind was Ann Arbor, Michigan. Why Ann Arbor? Well, this Southeast Michigan city is full of date night spots! There are live entertainment venues, hundreds of restaurants, cozy coffee shops, and swanky cocktail and wine bars. Home to two fabulous boutique hotels too, you could easily extend date night into a weekend-long romantic getaway. Since Ann Arbor offers such a breadth date-night activities, I’ve narrowed this list down to seven of my favorite romantic experiences for couples in love — with each other, of course, but also with food and drink. So, read on for seven ideas for a foodie date night or to fill your couple’s getaway itinerary in Ann Arbor! Disclosure: This sponsored post was created in partnership with Destination Ann Arbor and Wanderful. This post also contains some affiliate links. When you click on one of these links and book your hotel stay at no extra cost to you, I may earn a small commission. As always, all opinions are my own. 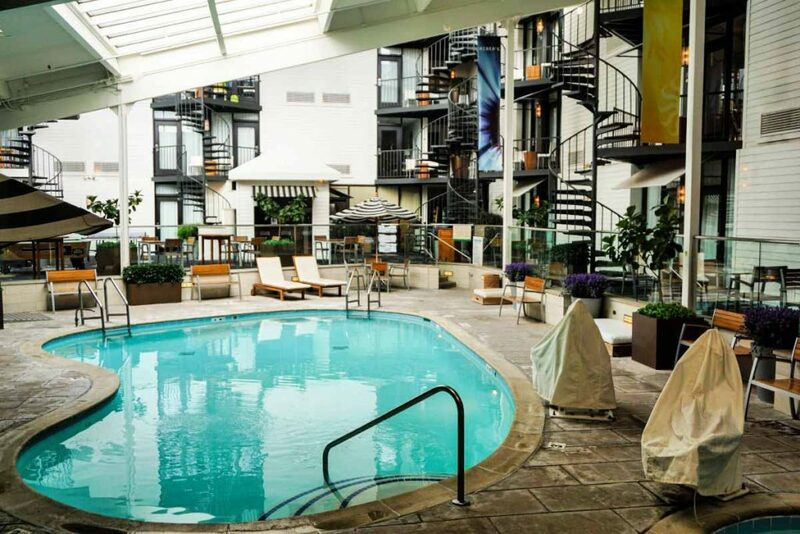 If you are visiting Ann Arbor for a romantic getaway, the first thing you’ll want to do is check into one of the city’s boutique hotels. With either of the hotels I recommend, you and your significant other can relax and spend quality time together. For my readers local to Ann Arbor or the nearby Detroit area, either of these hotels would be perfect for a romantic staycation. No kids, no cleaning, no cooking, no responsibilities — just pure relaxation with the one you love. With an indoor salt water pool, hot tub, sauna, and a fine dining restaurant, Weber’s has all the makings for a romantic evening for two. With all of those amenities under one roof, there is no reason to leave the hotel. 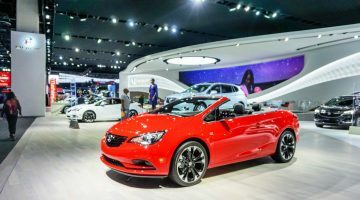 Yet, if you want to, you’ll only be a short drive from downtown Ann Arbor’s dining, shopping, and entertainment venues. Personally, if I were booking a staycation for me and my BF, we’d start our stay relaxing by the pool with a good book or taking a steamy dip in the hot tub. Then we’d dine at Weber’s Restaurant, where a pianist sets a romantic ambiance. Dinner of Alaskan king crab legs, Maryland crab cakes, a perfectly cooked filet mignon, or the famous prime rib would follow. With a wine list that features some of the finest Napa Valley Cabernets and Bordeaux red blends, a bottle of wine would complete our romantic dinner. We’d be sure to save room to share dessert, too! With on-site fine dining and the option to have breakfast in bed, an overnight stay at Weber’s would be a lovely way to celebrate an anniversary or special occasion. You can book your recently renovated room now on Booking.com! Weber’s Restaurant & Boutique Hotel is located at 3050 Jackson Road, Ann Arbor, MI 48103. As I mentioned, Weber’s Restaurant & Boutique Hotel is ideal for couples looking for a relaxing getaway where amenities are conveniently under one roof. On the flip side, for couples wanting to spend their Ann Arbor date night at the downtown restaurants, I recommend Graduate Ann Arbor. Located only steps from the University of Michigan campus, you’ll experience the comforts of a boutique hotel in a fun collegiate-inspired locale. I imagine if you met your sweetheart in college, staying at Graduate Ann Arbor might spark a little nostalgia. With whom would it be better to relive your university memories? So, with your college flame at your side, take a stroll through campus. Then dine downtown and enjoy a nightcap in the hotel’s old-school cocktail lounge. You can book your collegiate yet cozy room or suite now at Booking.com! Graduate Ann Arbor is located 615 East Huron Street, Ann Arbor, MI 48104. Inspired by Parisian bistros of the 1930s, the Standard Bistro & Larder is one of Ann Arbor’s most romantic restaurants. Settle into a plush booth at a white tablecloth-covered table, as your taste buds journey to France through James Beard Award-winning chef Alex Young’s cooking. Begin your evening with a seasonal cocktail as you share a steamed bowl of Blue Hill Bay Mussels in a white-wine broth. Then ask the sommelier for a French wine to pair with your Grilled Gulf Shrimp Beurre Blanc or New York Strip entree. For dessert, go savory with a selection of cheese or sweet with a lavender lemon tart or vanilla crème brûlée. 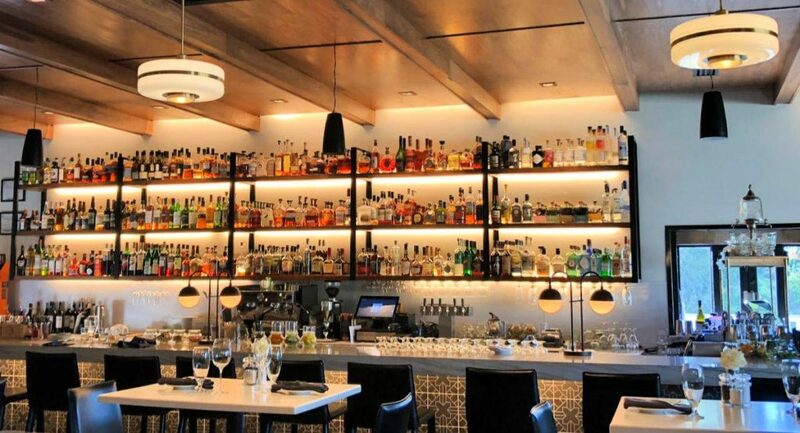 Date night at The Standard Bistro & Larder is wining and dining at its best. The Standard Bistro & Larder is located at 5827 Jackson Rd, Ann Arbor, MI 48103. Looking for a more casual date idea? 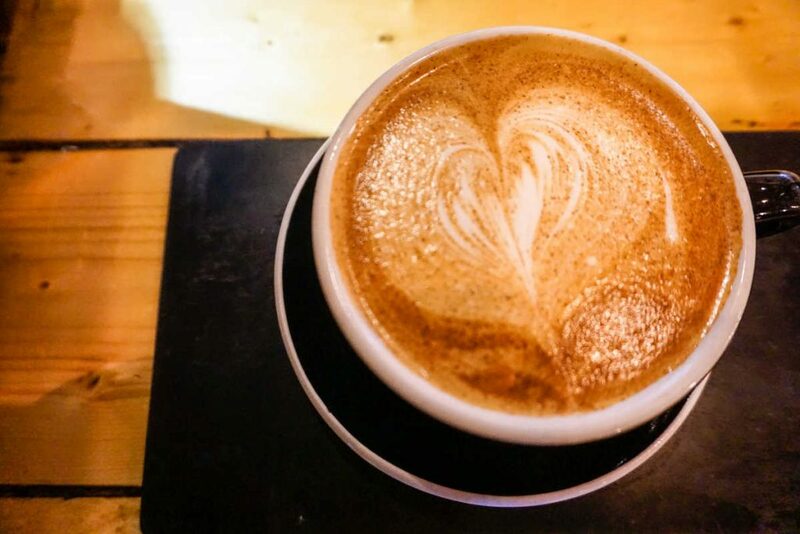 In Ann Arbor, there is no shortage of local coffee shops for a romantic rendezvous. Warm up in the chilly Michigan winter with a steamy latte at Cultivate Coffee & Tap House in nearby Ypsilanti, or browse novels together at Literati Bookstore with an espresso-based drink from the upstairs coffee bar. Ah, the classic date night — dinner and a movie. In Ann Arbor, give your date night an exotic twist by watching a foreign film at the State Theatre. Then dine nearby at Taste Kitchen, where Chef Van combines his Vietnamese roots with traditional French technique to create mouthwatering dishes such as the salmon sashimi and seafood bouillabaisse. Tables adorned with white linens, candles, and vases filled with fresh flowers create an uncomplicated yet glamorous setting for dining with your valentine. 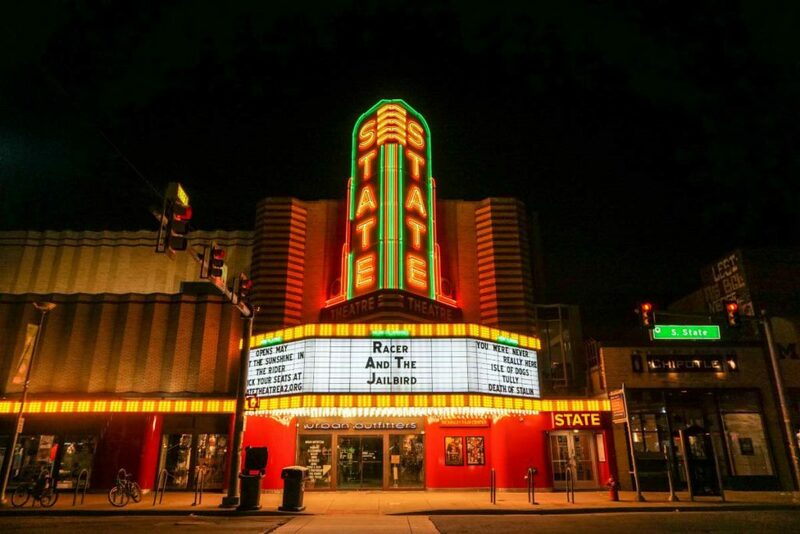 The State Theatre is located at233 S State St, Ann Arbor, MI 48104. A short walk from the State Theatre, Taste Kitchen is located at 521 E Liberty St, Ann Arbor, MI 48104. One of the most intimate experiences we can have with another person is sharing a meal together. Over a glass of sangria, conversation will flow. Yet the intimacy in dining at Aventura comes from sharing tapas. Certainly there is an excitement that builds when we try new and exotic foods, so go ahead and be daring. Never eaten octopus? Try it spiced with fingerling potatoes, pimentón, and a saffron emulsion. Why not make it a double date? Then your party can share the squid ink paella! Aventura is located at 216 W Washington Street, Ann Arbor, MI 48104. Though scientific evidence may be lacking, some claim chocolate is an aphrodisiac for women. Whether you believe in the power of chocolate or just love the taste, you’ll want to track down Mindo Chocolate, artisanal chocolates made locally in Dexter, Michigan. Also, if you or your partner loves chocolate, Zingerman’s Next Door stocks a case full of truffles and retail display of chocolate bars from around the world. Ask the staff for their favorites, and you’ll walk away with truly unique chocolates. Beyond chocolate, Ann Arbor is a sweet-tooth’s dream destination. 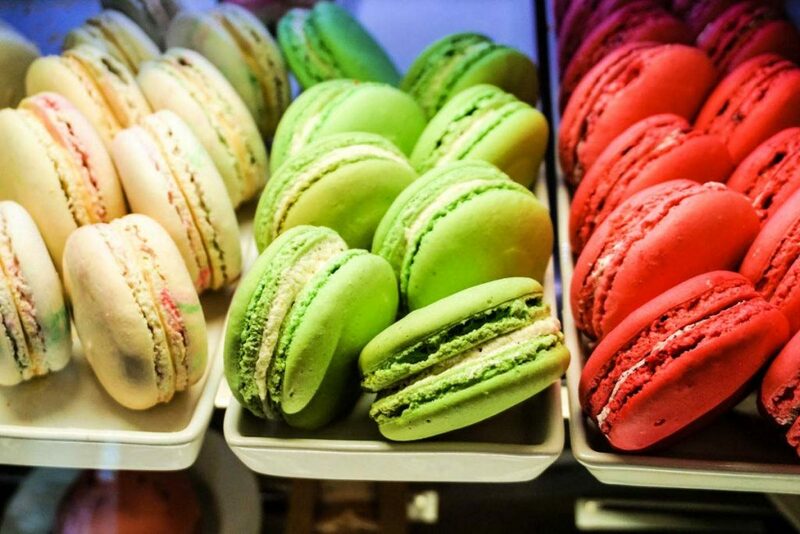 Take your date to Le Bon Macaron or TeaHaus for fancy French macarons and tea. During warmer months, cool down with one of Blank Slate Creamery‘s house-made ice cream flavors. Have an ice cream craving while Blank Slate Creamery is closed for the winter? You’ll find gelato at Zingerman’s Next Door and Zingerman’s Creamery. Neighboring Zingerman’s Creamery are two more stops for sweet-tooth couples — Zingerman’s Bakehouse for pastries and Zingerman’s Candy Manufactory store. For my final Ann Arbor date idea, I’m sharing one of my favorite date night activities — sharing a drink! 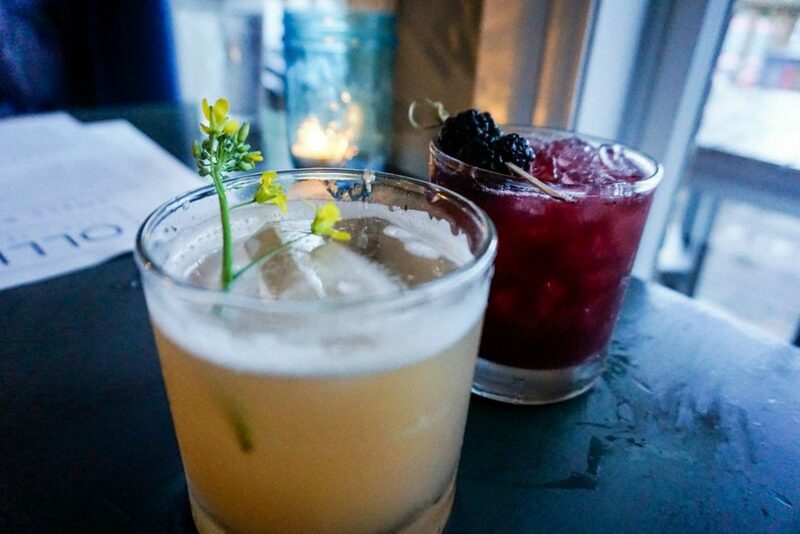 When my boyfriend and I did an overnight date in Ann Arbor, we loved the inventive craft cocktails at Ollie Food + Spirits in nearby Ypsilanti. We also indulged in a nightcap back at the Graduate’s Allen Rumsey Supper Club, where I had a refreshing gin-based cocktail cleverly named after the local botanical garden. 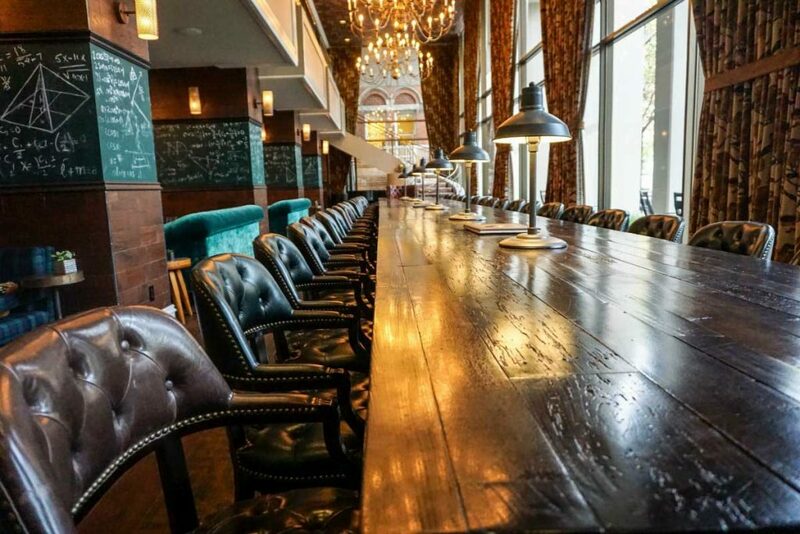 Other swanky downtown Ann Arbor spots for sophisticated cocktails include Nightcap, The Last Word, and The Ravens Club. Another option for date night drinks is VinBar, a cozy wine bar serving Black Star Farms wines from Northern Michigan’s Leelanau Peninsula. Lastly, for the adventurous-in-drinking couples, try something a bit different with a mead and cider tasting at Bløm Meadworks. You may have heard oysters are an aphrodisiac. Test the theory with your bae at seafood restaurant and martini lounge Black Pearl Ann Arbor! Want to keep the evening going? Check to see if there is live music at The Ark! Spice up your night (or brunch) over Mexican street food, tacos, and margaritas at Isalita! Sleep in and spend the morning snuggled up in bed, and then head to brunch at Sava’s! Together eat your way through Ann Arbor with By the Sidewalk Food Tours! Learn to make a date-night dinner by taking a Sur La Table cooking class! 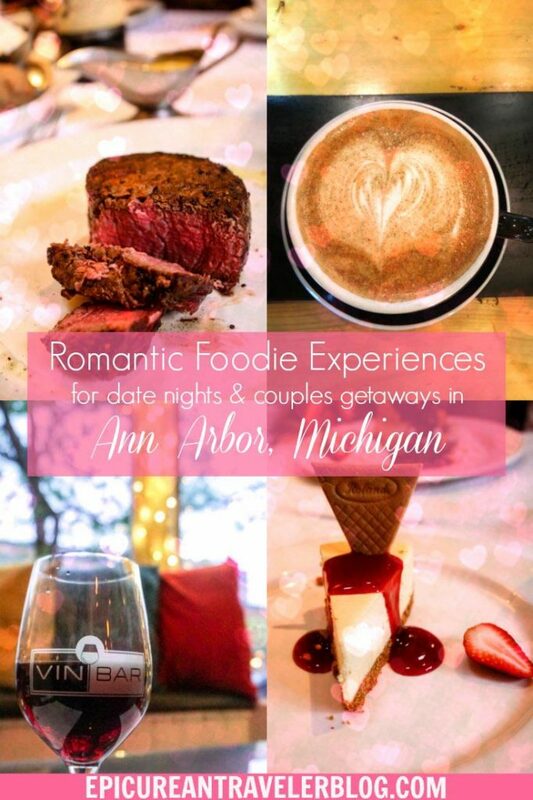 Save this post to Pinterest for future date night or romantic getaway planning in Ann Arbor, Michigan! 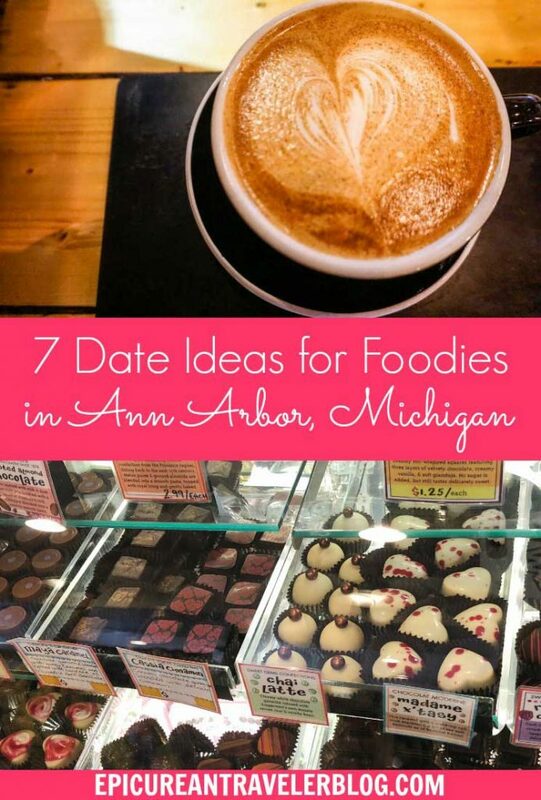 Which Ann Arbor date activity would you do with your boo? The Epicurean Traveler is a participant in the Amazon Services LLC Associates Program, an affiliate advertising program designed to provide a means to earn fees by linking to Amazon.com and affiliated sites. When you click on a link and purchase an item, I may earn a small commission that helps to sustain this blog. I thank you in advance for your continued support! Wow! So many fun options. 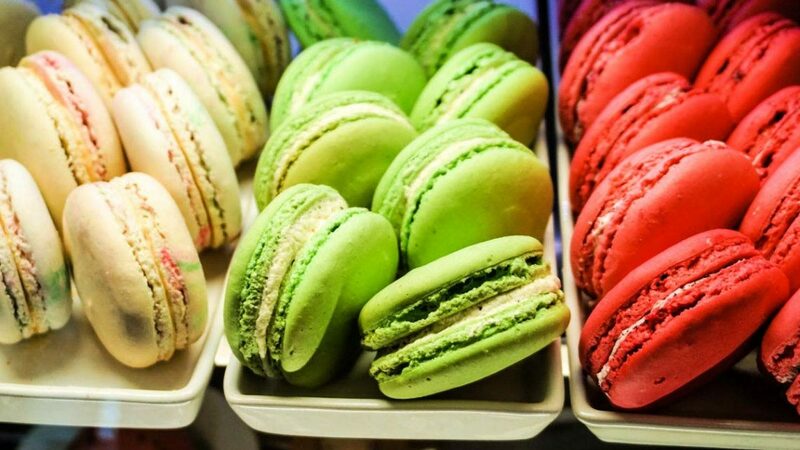 I have to say I loved the idea of enjoying tapas with my husband, or getting the macarons for a reminder of our trip to Paris. Even watching a foreign film sounds fun! This sounds like the perfect romantic weekend! 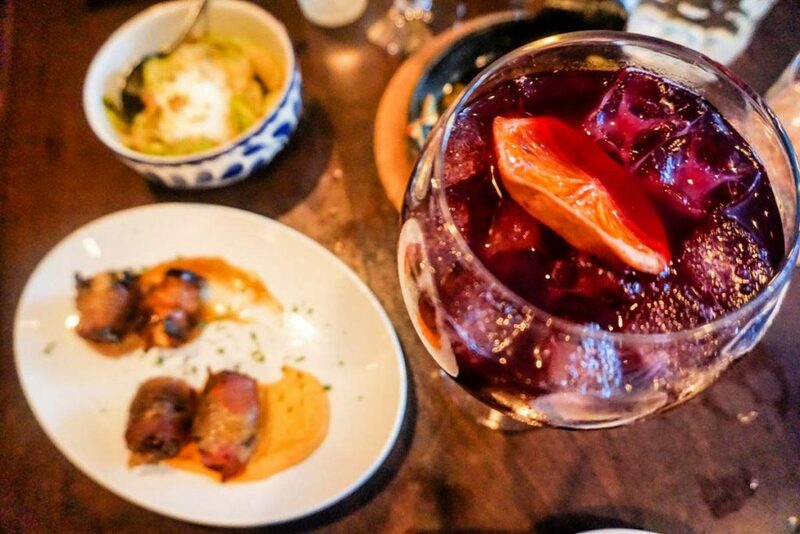 My first stop would be sangria and octopus at Adventura! On a side note, I almost went to grad school in Ann Arbor and from reading all of your posts I know I would have loved it. Oh my gosh, the Graduate looks so cool. I did meet my sweetheart in College and we got engaged on V-Day. Would love to spend my Valentine’s Day there! I love all these yummy photos! I’m totally a foodie! I will have to check it all out if I’m ever there. It all looks so divine and delicous, as I’m sure it was!!! All these places makes me wish I live in Ann Arbor! The food are mouthwatering too! I’ve always wanted to go to Ann Arbor! These spots look wonderful for date night.